EF Talk Scriber combines a text editor and an audio file player, designed to work like a dictation transcribing machine. 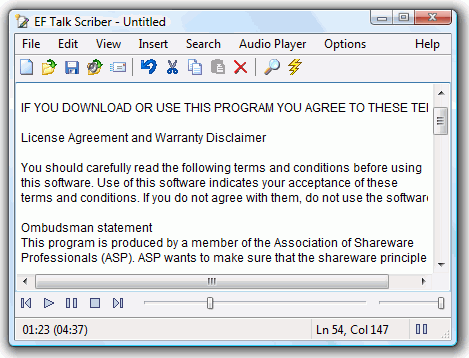 EF Talk Scriber offers the features of a full text editor and an audio media player, plus specific hot links support between text and sound. Your hands don't need to leave the keyboard -- you simply type the spoken words into your computer as the audio file plays. The text editor supports Unicode characters (XP/Vista edition only). The media player supports the usual audio file formats, including WAV, MP3, Ogg/Vorbis, FLAC. Fully featured high fidelity voice email client. Free to try. Qweas is providing links to EF Talk Scriber 2.20 as a courtesy, and makes no representations regarding EF Talk Scriber or any other applications or any information related thereto. Any questions, complaints or claims regarding this application EF Talk Scriber 2.20 must be directed to the appropriate software vendor. You may click the publisher link of EF Talk Scriber on the top of this page to get more details about the vendor.